(Tivi Etook in Myers [Mitchell] 1976:45). Born in 1929, in Qirnituartuq, near Kangiqsulujjuaq. “As a child, I drew wherever I came upon a stretch of smooth fine sand. I drew all kinds of animals. I drew villages, even though I had never seen buildings… Thoughts such as ‘This is what I’ll be doing for a living’ never occurred to me’” (Etook in Weektaluktuk and Bryant 2008:173). Although he had done some carving and liked to draw, Etook first came to attention in 1972, when the George River Cooperative delegated him to attend a cross-community printmaking workshop in Puvirnituq. Nevertheless, Etook says: “When I was chosen to attend the course, it took a long time for me to make up my mind to go, as I was unable to see the value of drawings” (in Myers [Mitchell] 1976:42). Stories and legends passed down from elders, community and personal history, and from his own observations. “When I was young, I used to watch the movements of living things—the seals, the caribou, the ptarmigan and other birds. Then I would draw them in the smooth sand along the edge of the lakes. I would also draw the tents of the people and the people hunting for seal or caribou” (ibid.). “I think and plan for a long time before doing a stonecut. I think of the old ways of our people or the land, and of the animals. I think of the legends, which I heard as a child. Particularly, I think of these stories and I grieve that the great storytellers of old are dying and that their stories are going to be lost. From our stories we learned of times when food was scarce and people strove to excel in hunting and to learn the ways of the animals, the sea, the land, and the weather” (ibid.). Stories about the past, legends, and the supernatural. “I have always been concerned with supernatural things. I believe that the spirits were not created by man and that they were very powerful. There were many spirits in former times and they influenced the lives of the people. Although I do not want to believe or follow the old ways which involved these spirits, I feel that we should reveal the things which exist and should perpetuate the stories which are told about them. These beliefs and the stories should not be lost and our own children, who know nothing of hunger or starvation, should be informed of the way their ancestors lived” (ibid., 45). “The expressions on the faces of his prints—whether it is an animal, a person, or a being from beyond - give depth, a depiction of something fresh. Sometimes it is the freezing of a reaction, a look of determination, or an immersion in a reflective moment” (Weetaluktuk and Bryant 2008:159). 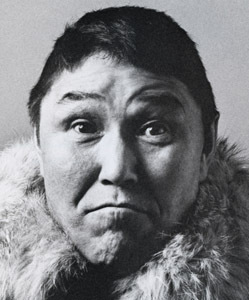 In 1976, Marybelle Myers (Mitchell) wrote: “Caricaturing comes naturally to Etook who has a local reputation as a humourist, able to jab fun at himself and the Inuit style in quick sketches, which he does for amusement. His sense of the absurd carries into his prints where it takes the form of unselfconscious satire” (p. 5). In 1975, Etook was the first Inuit artist to publish a solo collection of prints. He published a second collection in 1976 (see Mitchell 2001:3). The World of Tivi Etok—The Life and Art of an Inuit Elder, a 210-page trilingual book about his life, was published by Avataq Cultural Institute in 2008.